Thebe Magugu has travelled to two international fashion capitals this year to present his namesake Fashion brand + his faux ostrich PINK coat is now part of a fashion museums permanent collection. 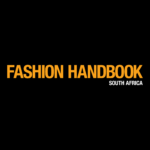 The International Fashion Showcase (IFS) nurtures and presents work from the most exciting fashion talent from around the world, tell us about your participation representing South Africa in the IFS program 2018/19? After being approached to submit an initial proposal and then samples to London for a panel of press and buyers, chaired by Sarah Mower, I was then fully accepted into the IFS programme. Going to London was truly incredible. The recognition to participate in such a prestigious program resuscitated my self-belief and came as a sort of validation at a time when a lot of self-doubts had crept in. I learned so much from the people I met, like Susie Bubble and Christopher Raeburn and about the larger fashion industry. And it both made me feel like a speck within it all but also like the world is my oyster. I gained access to information I otherwise would never have come across and contacts I never would’ve dreamt of getting this early in my career. One of the most important takeouts….the sense of community, sense of openness and readiness to share and collaborate. Trying to get to the top alone will not move us forward. Collectively, we can rise when we work together. What is the International Fashion Showcase (IFS)? 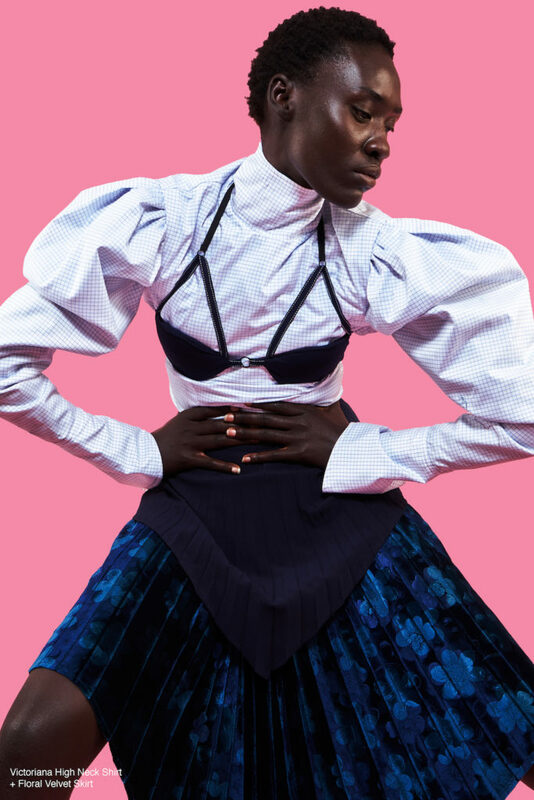 Established in 2012, the IFS is a platform for emerging fashion designers to exhibit their work during London Fashion Week. 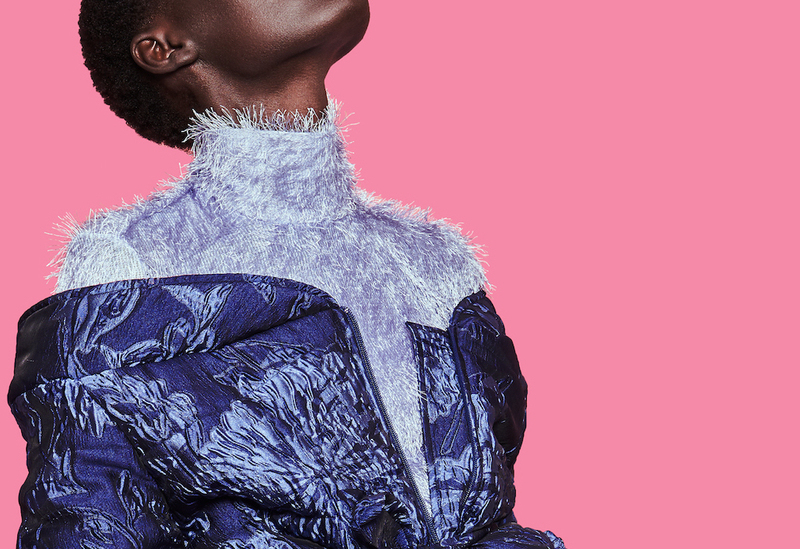 Bringing cutting-edge fashion design to London from around the globe, IFS invites 15 emerging international designers to explore different cultures and consider current world issues through fashion. To date, IFS has showcased more than 600 designers from 70 countries. It includes a tailored programme consisting of business development and a creative residency within Somerset House Studios in London and culminates with a free public exhibition during London Fashion Week in February 2019 at Somerset House. The showcase of work developed by the designers is in a series of spatial installations, exploring urgent issues and new ideas that are shaping fashion globally. 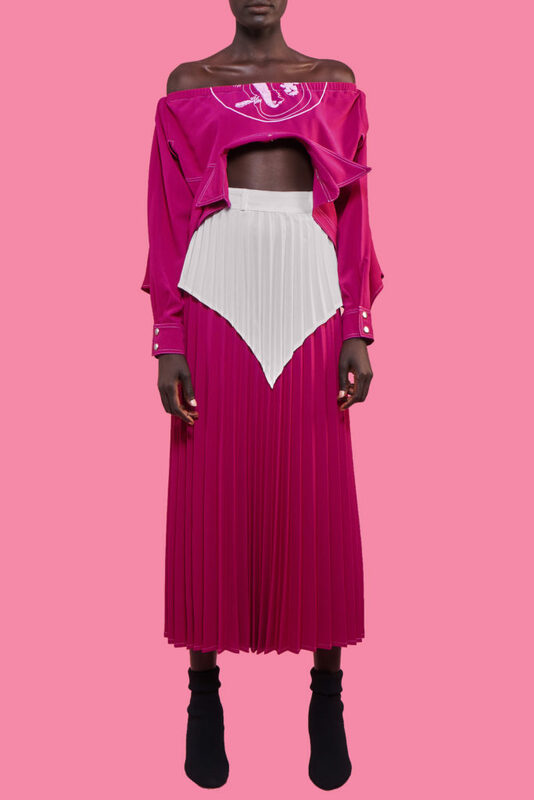 After receiving an invitation from the head of Vogue Italia’s Vogue Talents project Sara Maino, Thebe Magugu is only the second South African Fashion designer to participate in the Vogue Talents who is on next? An event during Milan FashionWeek. What was it like to present your latest collection first to international media and buyers and then in a public exhibition during Milan fashion week this year? Milan was an opportunity to present the Thebe Magugu Brand on another level, so I was positive and excited. It felt like a ‘far-fetched to reality’ experience as some brands and people I knew only via social media . And then found myself interacting and engaging with them. After Milan, and all the feedback I know for sure that in 2019 I will look into exporting more. How does it feel to know that one of your designs from the Gender studies collection is now permanently in the FIT museum NY? It’s such an honour. I felt really honored to have one of my pieces, the Faux Ostrich coat part of the F.I.T Museum’s new exhibition titled Pink: The History of a Punk, Pretty, Powerful Color”. Curated by Dr. Valerie Steele, director of The Museum at FIT, it explores the changing significance of the color pink over the past three centuries. The Fashion Institute of Technology New York is a specialized fashion museum whose mission is to advance knowledge of fashion through exhibitions, programs and publications. 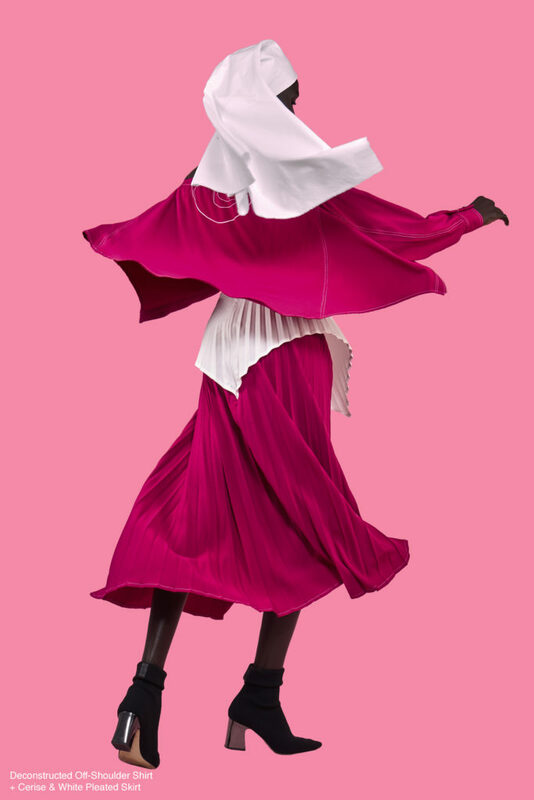 The F.I.T Museum’s new exhibition titled Pink: The History of a Punk, Pretty, Powerful Color features approximately 80 ensembles from the 18th century to the present, with examples by designers and brands such as Elsa Schiaparelli, Christian Dior, Yves Saint Laurent, Alessandro Michele of Gucci, Phoebe Philo of Cèline and Rei Kawakubo of Comme des Garçons. My brand new collection, ART HISTORY, is being presented at South African fashion week (October 2018). I’m taking artistic motifs and subject matter from South African art with surrealist prints and color combinations and merging those with silhouettesand shapes that have a conservative, almost ecclesiastic feel and proportion to them. That meditation between forward looking [art] and traditionalism [history] is the starting point. The collection explores the contrasting and sometimes conflicting planes we exist in at the same time. I am going to ruthlessly pursue a studio space, and my key focus is to grow the THEBE MAGUGU brand in and beyond South Africa.